Christine Erratt has had a keen interest in Australian silverware since the 1970s. 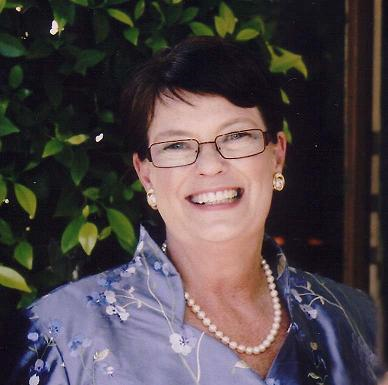 She joined the Silver Society of Australia in the 1990s and has been a regular contributor to the Silver Society's newsletters and journals. Christine has written many articles for other magazines and publications, and the introductory catalogue essay for a contemporary Australian silver exhibition in 2008. She has toured Australia lecturing on the subject of Australian silverware during the era of her interest as well as on Australian Women Silversmiths. She is also a long standing member of the Australiana Society and the National Trust of Australia. In 2012 she was awarded the Peter Walker Fine Arts Writing Award for her study of Ceremonial Maces of Australian Universities, published in Australiana, the research magazine of the Australiana Society. The Publisher is now selling this book for a special price of $50 including postage and handling for orders placed for delivery within Australia. This book is available from Parker Press at $30 including postage and handling for orders placed for delivery within Australia. Please send an e-mail to information@parkerpressbooks.com.au stating your order enquiry and the country of delivery. You will be advised electronically of the cost and payment methods available. This unique reference book is a comprehensive collating of information about the makers and retailers of Australian silverware in the era covering the second half of the twentieth century and the marks they have used to identify their work. The information in this book enables Australian silverware to be identified by the individual marks. It also gives a history of silversmithing in Australia during the era through its detailed resum�s of the makers and retailers. The author photographed the marks of the makers and retailers and presents graphic, clear images of them. This method of identification is superior to hand-drawn representation and will enable the reader to easily identify marks. Glossary of terms used in silversmithing. This book is an indispensable reference book for anyone with an interest in Australian silverware. "For the foreseeable future this invaluable compilation of Australian marks on silver will serve as the principal identification resource for connoisseurs, academics, curators and students." - Emeritus Professor Ray Stebbins, former Inaugural Professor of Gold and Silversmithing, RMIT University, Melbourne, Victoria. Christine Erratt, an Australian Society and Silver Society member, spent seven years putting together the information for this useful reference book. It aims to include both makers' and retailers' marks of those who produced a substantial body of work, and marked it. With no formal Australian hallmarking system in place, a list such as this is essential to identify makers' marks. Some makers use initials and some use symbols. The first section lists the alphabetical marks followed by the symbols, each illustrated with a photograph. The second section lists 300 makers alphabetically, with photos of their marks, a summary of their career, and a list of collections where they are represented. Without a mandatory Guild Hall system, makers are free to vary their marks. Some makers used four or five marks, each of which is illustrated. Interspersed in the text are photos, colour or black and white, of about 60 objects. The book, designed and printed in Australia, is a tribute not only to the author, but to the hundreds of silversmiths represented. Christine Erratt's book is a handsome addition to the small list of essential reference works on Australian decorative arts. I often hear grumblings that lament the decline of American craftsmanship, especially as it pertains to silver. 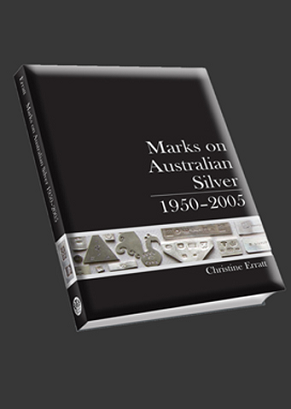 With the silver collectors' focus intent on nineteenth-century wares and current production standards up against a constant and impossible measure to their century-old predecessors, it was refreshing and encouraging to read Marks on Australian Silver 1950-2005 by Christine Erratt. Having extremely minimal exposure to Australian silver, my interest level has grown as I try to determine if the actual product standards match the style, education, and unique presentation brought to life through observing the makers' marks. This book is constructed in a simple and effective manner that is visually impressive yet understated. The size is ideal for its purpose as a true reference book and the glossy paper quality is fitting as well. There are two primary sections of classifications; the first displays the marks alphabetically and by symbol with a reference to the more extensive second section which outlines detailed silversmith history with chronology such as apprenticeship, education, studio connections, collection and exhibition involvement, and more. There is a lack of personalization and opinion to the summaries that is intentional and allows the book to maintain its function. Included are several example pieces of Australian silversmith work such as jugs and goblets that provide context. Despite this objective approach, the varying levels of style and art that Australian silversmiths bring to the creation of their marks help to introduce the unique and non-conforming approach to this 'system'. During a speech for the book's launch, Emeritus Professor Ray Stebbins summarizes the purpose of the book using four words: coherent, comprehensive, credible, and invaluable. Stebbins provides background on the author by stating: "Christine approached this research project from outside the discipline; she is not a silversmith - rather she is a collector with a passion for silver who had encountered a problem of identifying Australian makers. Perhaps because of this external perspective she has delivered a book on visual arts that is refreshingly coherent with no 'art speak' jargon, and no theoretical or conceptual paradigms. Its contents are clearly accessible to makers, collectors, curators and conservators." Any opinions expressed are the opinions of the author and no part of the books may be copied or reproduced for publication or display without having first obtained the express authority of the author in writing. The information provided within these books is believed by the author to be accurate at the time of publication but no warranties express or implied are given as to its accuracy. This 112 page soft cover 190mm x 230mm book. "Christine Erratt has carefully traced Hendrik Forster's journey across the last four decades, identifying many people and events that have helped shape it along the way. Welded into the narrative are accounts of his core interest in metals and complex sources of ideas, as well as his values regarding art, design and skill. Significant is his response to both his own cultural heritage and that of Australia, addressing in his contemporary context what many migrant predecessors have responded to in theirs. Hendrik continually reassesses his directions, often working alone, while also entering into valuable technical and industrial collaborations. He moves easily between hand skills and semi-industrial processes to make one-off exhibition pieces and large sculptural works, as well as multiples such as settings of tableware. Many of his works are special pieces commissioned by clients, usually for significant occasions or places. 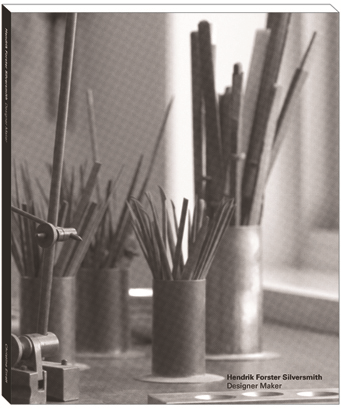 This publication is a valuable resource for those interested in the intersection of skills and ideas across the spectrum of art, crafts and design, as well as being a very welcome record of 40 years of Hendrik Forster's exceptional experience." "There are a number of processes in silversmithing which are also arduous, physically demanding, and tedious - unless you approach them with the right kind of Zen. Then you can discover such things as the beauty of the polished mark that every hammer blow leaves on an annealed dome of silver or the texture of a newly filed surface. For over forty years, Hendrik Forster has been putting his Zen philosophy into practice, as evidenced in all of his work: in the pared-down pure lines of beauty, and the perfect harmony of form and function. Christine Erratt has written an engaging account of Forster's professional life, from the early years of his training and journeymanship in Germany, to his emigration to Australia and the maturity of his skill to become one of this country's master craftsmen. This is a fascinating account of the evolution of creative talent. Forster's most exquisite pieces are examined in detail: their purpose, design and execution. The text highlights how the skill taken in the creation of a small piece of jewellery is, in essence, the same as that needed to perfect a towering sculpture. Along the way, it reflects on the people, landscapes and materials that have influenced Forster's work. To be an artist is to find one's centre of gravity and reflect that state in one's medium. To be a craftsman is to work with head and hand in harmony with the material and its natural laws. This is a story of what it means to be a master craftsman." Thirty-six of Australia's universities have ceremonial maces. 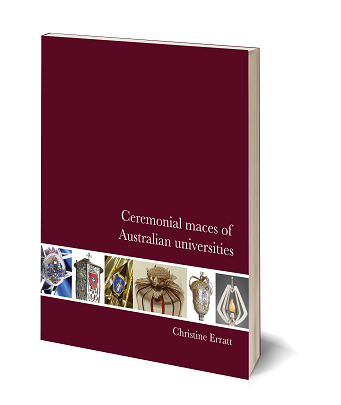 This study presents information relating to the ceremonial maces of those 36 Australian universities and includes 40 maces. Four universities, The University of Queensland, Charles Sturt University, Griffith University and the Australian Catholic University, have replaced their original maces with new maces. Australian university maces are extremely varied in their designs and many have symbolism reflecting aspects of their individual university. Some have been commissioned by the universities themselves, others have been presented as gifts by benefactors. Thirty-three of the maces were made in Australia; seven in England. There are 138 colour photos in this 56-page book. Each mace appears in its full length as well as having close-up photos of details of its design. A separate section has an illustrated description of the intricacies involved in designing and making a mace. Maces are listed chronologically and a detailed description is given of each mace. Details are also given of their benefactors, designers and makers.